You can make your Smartphone smarter by many ways. How wonderful it is going to be if your Smartphone can enable free calls all over India without the need of using too much internet. However, many amazing applications available connect you to your dear ones such as Watsapp, Facebook, Viber, and Messenger. With these apps, you can make easy phone calls, but it eats up too much internet and many times voices are also interrupted. If you are having an extremely good internet connection in your phones only, then it is better to talk using these apps. It is going to be great if you can talk to your friends and family offline. The good news is that this facility is available. There are many applications available that can let us ease our mobile phone bills. It is surprising how you can make calls without paying or use of data. Here are five best free calling apps which do not require any internet connection. There are many more Cell Phone Applications available for free calls. This app is simply amazing because it lets you call on landline and mobiles anywhere in the world. There is no need to have bigo application either, but still if you are having it, then it is good. With this app, you will gain credits. You can gain ten credits daily by just logging in to the app. By inviting friends, you can gain huge credits in your accounts. If you invite a friend, then it will give you twenty credits. Using these credits, you can make calls anywhere. Click here to Download Bigo! This is another VoIP calling application that offers free call facility to its user. You get unlimited calls, free thirty minutes every month to call those who are not using this app. If you refer friends, then you get free sixty minutes. This application just needs little sharing and you gain many credits in your account. Click here to download Libon! This app is a latest entry and offers unlimited nanu to nanu net calls and fifteen minutes offline calls to the app users. There is no need to connect to the internet in the offline setting. There are many countries in which nanu provide services. This means you can save your minutes for non-nanu users on the ISD codes, which is simply amazing. This app is going to benefit you for both for nanu users and those who are not using it. It is simple app, but very powerful, that lets you enjoy calling for free without any internet connection. Click Here To Download Nanu! This is also a free calling app. This one is the only calling app that lets user make free long distance, short distance, international calls over 2G, 3G, 4G , wifi networks also to those who are not having this pap installed on their smart phones. This app is best for all those who are having family and friends in other countries. Without spending huge sum, you can connect with your dear ones and talk to them for free whenever you want. You get unlimited calls, presently providing services in many countries such as Singapore, Germany, New Zealand, Canada, Australia, Thailand, USA, US, Mexico, and many others. Click Here To Download Viper! This one is a very popular application that number of people have tested and tried. This app is now available all over the networks, but having twist involved. Reliance and Tata docomo customers get free call directly through this app and duration is two min to four minute. Other operators gets ten free recharging with just viewing forty apps. There are many unique features this pap is having that attract most of the people. There is no internet required; you just have to watch free videos of five to ten seconds to get free rewards. It also works on the wifi connection that lets you save huge amount of sum on your phone call bills. It is easily available on the play store. Click Here To Download Tango! These are the five best free calling apps that you are definitely going to find amazing. At all these apps are for Indian users who can make free calls. You can use these apps to make landline and mobile calls. There are five and you can have them in your smart phone to make it smarter. 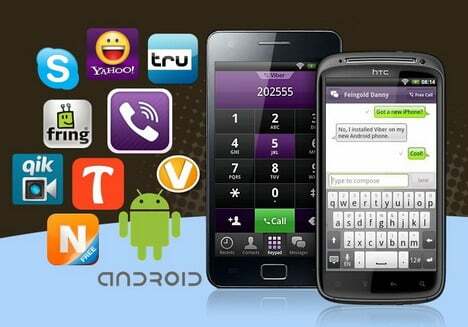 Download your free calling apps.